England Vacations....from quaint villages to historic towns and cities....you're going to fall for this lovely country! Are you considering your first trip to Europe? England, UK is the perfect choice ....no language issues and there is so much to see and do in the many interesting and diverse parts of the country. Are you a European from the continent? How about England for a short break in UK. Along with London, there are lots of destinations in England from which to choose for England getaways. For me, the English countryside is best (but, I love to get outside of the city, "closer to the people" ). I would head toward the Cotswolds as an introduction to England. It isn't far from London (only a couple of hours or less). Exploring the charming villages and beautiful countryside can't be beat! Some other great areas to explore and which will be added soon to this site include: the Peak District, the Lake District, the rugged Corwall peninsula and much more. London has two major airports, London Heathrow (LHR) and London Gatwick (LGW). To check for the best airfares to either of these airports, you can find cheap flights from 100+ sites with one click . They drive on the left, but after you get accustomed to this it is easiest to get around by renting a car . If you are staying in London, just use public transportation. 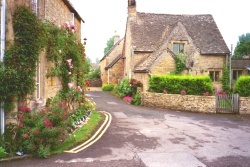 Quintessential England, the Cotswolds are called the Heart of England. The beautiful green rolling hills dotted with quaint villages will leave a lasting impression on you! If you have a favorite destination in England, please share with us here!